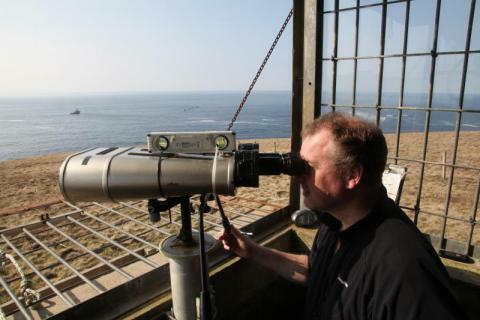 Marine mammal and seabird sightings were recorded from a hilltop on the island of Eday, overlooking the site. Data were collected to provide information on distribution and ‘relative’ abundance of animals in and around the study area. A telescope (Opticron GS 815) set at 20x magnification was used to scan the channel to detect any animals on the surface of the water. If necessary for identification purposes, magnification was increased up to 60x. The watch rota followed from project initiation until July 2010 was based on observer experience, aiming to sample across the range of daylight hours and tidal states. A standardised methodology, as follows, was initiated on April 1st, 2011. 2 different watches per day for Jan, Feb, Mar, Oct, Nov, and Dec; 3 watches for Apr, and Sep; and 4 watches for May, Jun, Jul, and Aug. These encompass the periods between 0400 and 2000. EMEC Fall of Warness Wildlife Observation Data is located in United Kingdom.